love cookie dough. I also love chocolate and peanut butter. When I was making cookies last week I decided to forego the baking. And these Peanut Butter Chocolate Cookie Dough Bars were born. Since then I’ve made lots of cookie dough treats. And this week, I’m going to share two more! It’s cookie dough week with some of my favorite blogger friends and each of us are sharing two amazing recipes with you featuring eggless eat-all-you-want cookie dough. Last week I shared some Dark Chocolate Pudding Cookies with y’all. Since I tasted that batter (I mean, it’s a job requirement) I knew my next cookie dough recipe had to be chocolate. DARK chocolate. 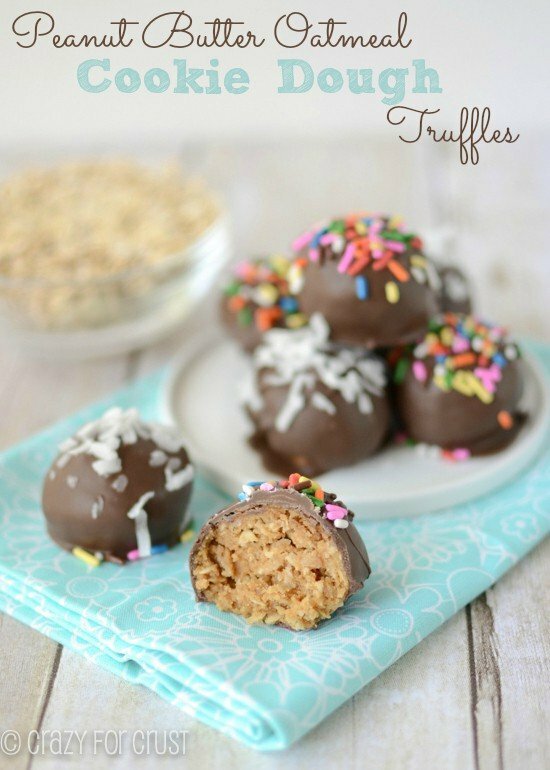 I was thinking truffles, but then I remembered Aimee’s Malt Ball Cookie Dough Bars. And Averie’s Chocolate Chip Cookie Dough Bars. Bars. Of cookie dough. Like a truffle without rolling. Like bark without breaking. Genius! These cookie dough bars couldn’t be simpler. 1. Make cookie dough without eggs. Substitute 1 tablespoon milk for each egg to replace wetness. 2. Press cookie dough into pan. 4. Melt some peanut butter into white chocolate chips. Spread over top. 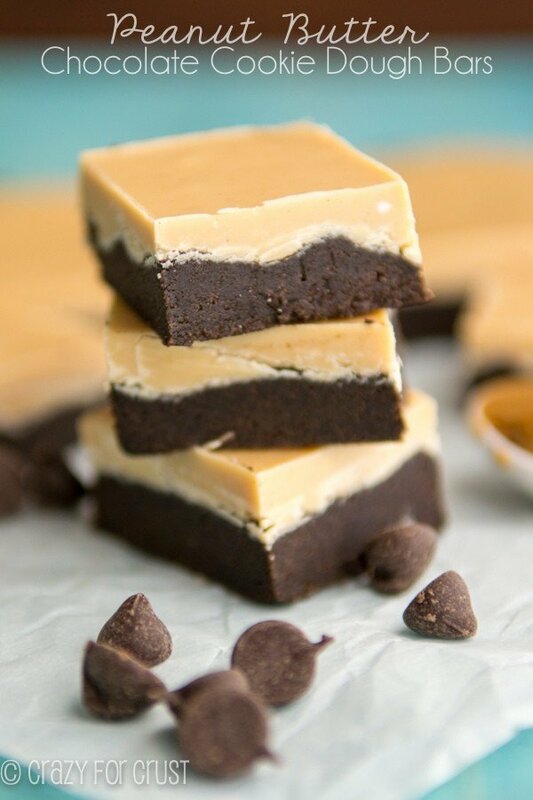 Peanut Butter Chocolate Cookie Dough Bars. Like fudge, but it’s cookie dough. Like a peanut butter cup but better. Egg-less dark chocolate cookie dough is pressed into a pan and topped with a white chocolate peanut butter. This is the best way to eat cookie dough! Line an 8x8” pan with foil and spray with cooking spray. The foil is for easy removal. In the bowl of an electric mixer fitted with the paddle attachment, cream butter and both sugars. Mix in vanilla and milk until smooth. Mix in cocoa powder. Beat in flour and until well blended. Press into prepared pan. 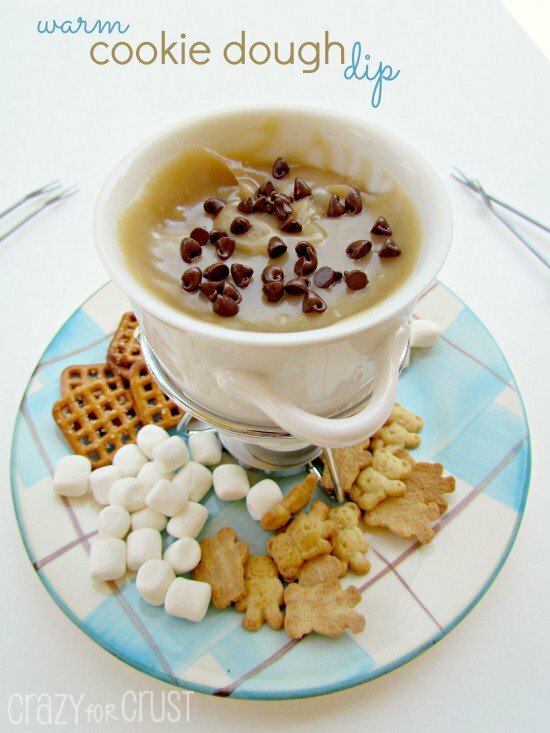 Place white chocolate chips and peanut butter in a medium microwave safe bowl. Heat on HIGH in 30 second intervals, stirring in between, for about 1 minute. It may need an extra 15-30 seconds depending on your microwave. Spread over cookie dough in pan. Chill until set. Once hardened (about 2 hours), remove from refrigerator and let sit at room temperature for about 30 minutes before slicing so that the topping doesn’t shatter. Store in a covered container in the refrigerator. It’s Cookie Dough Week! A bunch of my friends and I got together and made cookie dough recipes for you. There should definitely be a law that peanut butter and chocolate should be eaten daily! 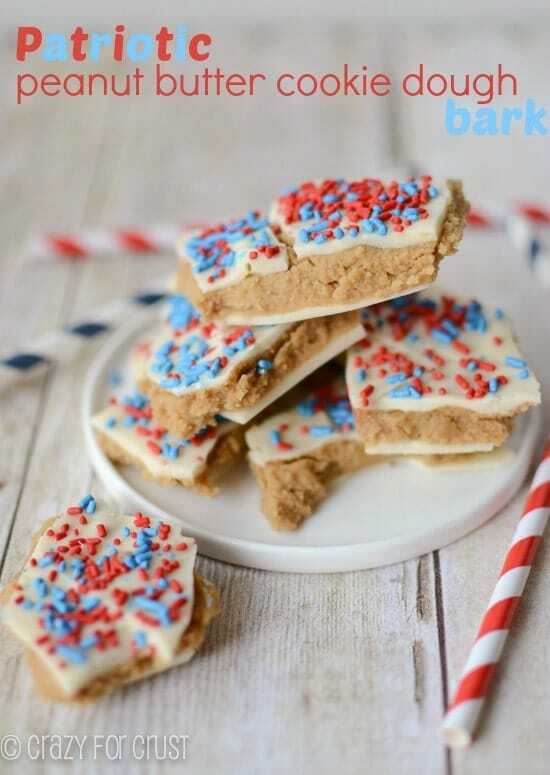 in the form of these amazing bars, if possible! They look so tempting Dorothy! I have never seen a more perfect bar in my life. No seriously, the edges of this decadence is unreal! Perfectly sliced and for whatever reason I see a wave effect going on with the white-chocolate-peanut butter which is mesmerizing- very cool! GIRL! This is so much amazing cookie dough goodness I do not even know what to do!!! So rich, so dense, sooo yum! Not a bad thing at all. It’s what I do anyway…ha! Cookie Dough in bar form? Oh heck yea. I’m so glad you guys decided to do this whole cookie dough week thing. I’m loving it! just made these !! sooo good. I do think the sugar in the base could be cut down a little but will definitely be making again. im going to have to put them in the freezer so I dont eat the lot in one go !